Phawk’s mom, henceforth known as Barbara (because that is her name,) has graciously offered to come over on Saturday to help guide me in the ways of better sewing. I loved one of the lines in her email: “Historically speaking, it’s how quilters pass along their craft. The pioneer women helped teach each other and they shared scraps of fabric with each other (no Sew, Mama, Sew for them). I learned how to quilt by having people help me.” Not only am I getting in-person mentoring, but I’m taking part in a time-honored tradition. Being somewhat lacking in my own traditions, I’m pleased to find them wherever I can. Having roots and tradition is something I’ve long craved. My family has no distinct traditions, really… no strong ties to a motherland, no precious, time-honored, practically sacred holiday rituals, no prized recipes. On my mom’s side, there is only Mom and my two aunts left in the immediate family, and I never really knew anyone else from that side apart from my grandparents (and great-grandparents long ago.) My aunts have no children, and I likely won’t, either, so this fork of the Marshall tree likely dies with me. Perhaps with good reason. It was a troubled family. Mom didn’t really teach me a lot, in terms of housecrafts. I sometimes helped her cook, I had my chores and she half-heartedly showed me how to embroider, but more than teaching me how to do stuff, she just told me to do it. I believe some folks are born with an innate knowledge of How To Clean and Organize. I am not one of them. Clutter escapes my immediate notice, unless I really stop myself to see it. The mysteries of efficient and effective cleaning elude me to this day. At this point, now having a house to ourselves, I’m taking more of an interest in Making A Home and Other Nesting Activities, and I find myself resenting Mom a bit for not taking the time to instruct me on the basics of homemaking. To be fair, she might well have tried, and given what a tomboy I was, I might well have been completely disinterested and shrugged it off like an unwanted frilly frock. Dad taught me stuff – how to mow the yard, how to drive a car, how to ride a bike, how to plant stuff in the garden, how to play softball, how to identify trees and flowers and more. Good stuff, that. Dad is a fount of information. My dad’s side of the family is still growing and thriving, but the clan doesn’t get together for regular big family gatherings anymore, and really hasn’t, I don’t think, since my great-grandma died and our family Christmas parties along with her. It makes me happy, though, to have been able to spend time with people like my great-grandparents, from such a different and distant time, who lived life far more frugally and simply. As much as the new technologies must have boggled them as it came along, their ways of life would assuredly boggle us. Great-Grandma D would make the best, just simply the best cinnamon rolls and serve them up with glass pitchers of whole milk. My dad, his sister and her two kids (with their own bevy of children) still get together most holidays with my last surviving grandparent, my dad’s dad. My dad’s side of the family did a lot of farming. In the summers, I would sometimes go to a third cousin’s nearby dairy farm to be babysat, and I loved running around with the cows, calves and horses. My cousins and I played in the old barns’ haylofts and helped out with chores. I learned how to drive on a tractor in my grandpa’s field, I grew up in the middle of a corn field and spent time running around my great-grandfather’s tree farm and fields. There’s nothing like an old, fieldstone-based wooden barn to stir something deeply nostalgic in me. From my back yard on Ives Road, I could see not only several truly awesome barns, but also my grandparents’ house, my great-grandfather’s house, my aunt’s house, and an older cousin’s house, plus my high school boyfriend’s farm, far across the fields. When driving by the house I grew up in, I get acute pangs of wanting to stop in, just for a short while, to say hello to the trees we planted that now tower over the house, to see what they’ve done with the place besides build a giant pole barn over our orchard. The smell of manure from horses, cows and pigs was pretty commonplace driving around my old stomping grounds, and still to this day, I find the smell of horse poop comforting. Likewise, the rumbling of a tractor off in the distance. My dad spent a lot of his childhood running tractors and combines around on those same fields, too. I am envious of that time for him… I’m sure it was hard work, but I’ve got farming so romanticized in my head; living off the land, doing honest, physical work, doing something meaningful. I still envision myself someday in a big old 19th centure farmhouse, surrounded on all sides by rollings fields and giant old oak and maple trees, with a flock of chickens in the yard, plump vegetables in the garden, maybe some dairy cows in the barn… maybe some goats. It all seems so satisfying in my imagination, even with the amount of work it would involve. A large portion of me wants to be a farmhouse wife, taking care of the animals and the garden and the yard and the house all day, baking bread, fixing dinner for Mike when he comes home, then sewing contentedly by the hearth into the night. Making jams and jellies, canning tomatoes, heck, maybe going hog-wild and churning my own butter from the milk. I should have been born 30 years earlier… I could have been molded into the perfect 50’s housefrau. I have been eying cute aprons lately, but cleaning the house in a dress never made any sense to me. And heels? Ha. Give me Carhartts and good, solid work boots any day. Of course, cute little dresses and aprons don’t look so adorable on my ponderous bulk anymore, alas. My mother recently gave me a garbage bag full of childhood photos – ah, the gift that keeps on giving. “Remember your perfect little body? You’ll never get that back again…” and “what happened to my adorable baby girl?” When I was little, she taught me I was loved and had boundless potential, I’ll give her that much. Then, when I was older, she taught me how I had wasted all of that potential and just wouldn’t ever be quite up to snuff. In truth, I tend to agree – I’ve wasted so much time. This weekend, I took the back country roads from our house to Mason, the town where I grew up. It was a beautiful, sunny day, the perfect day for a drive in the country. I drove down Meridian Road, past farms I’ve driven past my whole life, most of which have been there since long before I was born – some since before my dad was born. Most of them are still farming, still doing the same thing they were doing when I was little. Many have gone from corn to soybeans, but such is the way of things. A few are run-down and abandoned. The fields were rolling and verdant and ripening, the deep green of the trees bordering them vibrant enough to bring tears to my eyes. This is the Michigan I came back to in 2006, and the Michigan I fell in love with for the first time ever. The comfort of being back in familiar territory, with terrain I still know like the back of my hand after basically 20 years of having been away, is deep and abiding. I was in Ann Arbor for 11 years, and then in Washington for another 8 before coming back home in a puddle of financial collapse and nostalgia. The Familiar wasn’t a sentiment I had become used to having around. Sure, I was basically familiar with Ann Arbor, but I hadn’t spent my childhood growing up there. I loved Washington’s beauty and vast forests, but it wasn’t Home. For better or for worse, Michigan is. Having Dad and Janet, my step-mom, around and nearby enough to see often is really nice, as is driving down these familiar country roads, seeing the lone, majestic trees in the middle of fields that are always The Perfect Tree – a tree that embodies the beauty of its species, allowed to take its preferred and perfect shape, unfettered by other trees in its way. Bit lonely, though, so it’s always a bittersweet thing, The Perfect Tree. 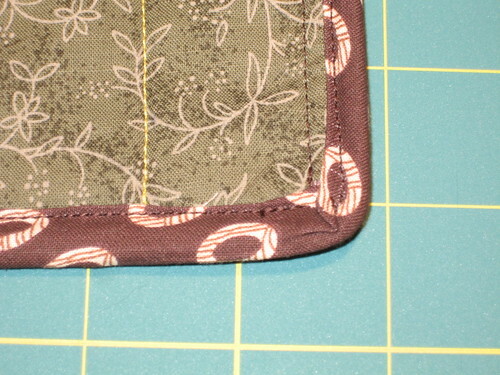 At any rate – the sewing. 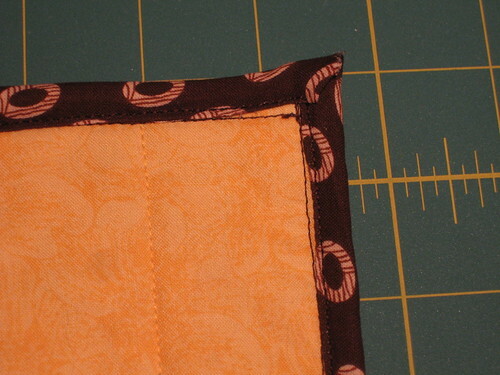 Last night and the night before, I made a few things for practical use – a potholder, and some bean bags. Indeed. Well, more correctly, rice bags. I have a neurological/sleep disorder that causes absolutely uncontrollable, relentless, truly brutal sensations in the left half of my body when I’m lying down. Normally, it’s controlled by meds, but I’m out, my doctor can’t see me for a week and they won’t give me a refill to tide me over (don’t get me started on the state of health care right now.) Night before last, on a suggestion from Mike’s cousin, Dave, who also has this same problem, I slept with a bar of soap. Seriously. Funny thing is, the bar of soap on one of the pressure points really worked. It got soap residue all over me and the sheets, but it provided some relief. I decided to throw together some small bean bags to see if they’d work, too. I made three and used them last night – worked like a charm. I didn’t take any pictures, because they’re made out of old, gnarly sheets and I threw them together in less than 10 minutes, but man – I wouldn’t have been able to do it had I not learned what I have thus far about sewing. 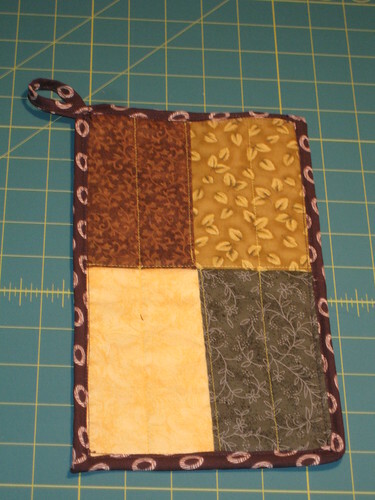 The potholder is prettier, but less useful, unfortunately. I only put in one layer of batting, and I think the heat is going to bleed right through very quickly. I’ll display it in the kitchen somewhere. When I make its siblings, I’ll be sure to use more batting. Not terrible, but far from perfect. Keep writing I love it! I think I may have slept thru most of my mom’s lessons on running a house. Oh well a really tidy house is a sign of a really boring woman! Your memories of your childhood are wonderful and stir up memories of my own. My grandmother was a wonderful quilter and she tried to teach me when I was about 12. Oh how I wish she was still alive today so we could share ideas! So instead of just talking about getting some chickens, you should get some next spring! I would kill to help you build the coop and pick out breeds and other chickenly things. I think I’d go into seizures if you said you were getting some goats at your place. Seizures of ecstasy. I could totally hook you up. I totally plan to hit you up for help and pointers, lady, trust me. Chickens in the spring are the plan – I’m just impatient and have to keep talking about them. 😀 red stars and … those black ones you were talking about. all i can think of is “australopithicus,” which (i hope) is something quite different.